This jumbled letters puzzle for the end of the school year will help to keep kids engaged during the last few days of the school year. 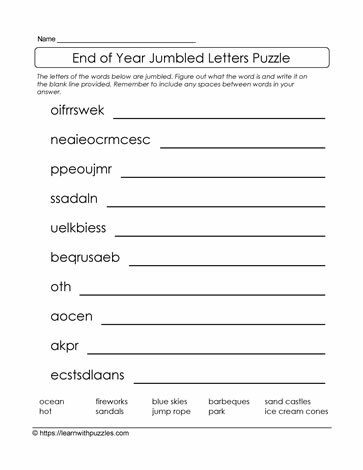 This puzzle focuses on words related to end of the school year while including a few summer words along the way. Word bank supports solving the puzzle. To create a more challenging puzzle, hide the word bank by covering it up, or when making copies, cover the word bank with a sheet of paper so it doesn't copy with the rest of the puzzle.